Akebia is chocolate vine. It is used in fermented sushi and tempura in addition to stir fries. Due to the fact that it is bitter as is base preparations or required before used in cooking. It contains pantothenic acid, vitamin C, and potassium. One chocolate vine contains 24 calories. 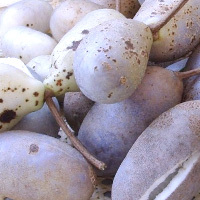 The calories in Akebia per 70g(1item of fruit skin) is 24 calories. Akebia is calculated to be 34Cal per 100 grams making 80Cal equivalent to 235.29g with 6.02g of mostly carbohydrates、0.21g of protein、0.21g of fat in 70g while being rich in vitamins and minerals such as Pantothenic Acid and Potassium.